Riverbanks Center caps its Summer Festival this April with the biggest & much-awaited event in this side of the metro which is the Philippine National Fireworks Festival (PNFF). 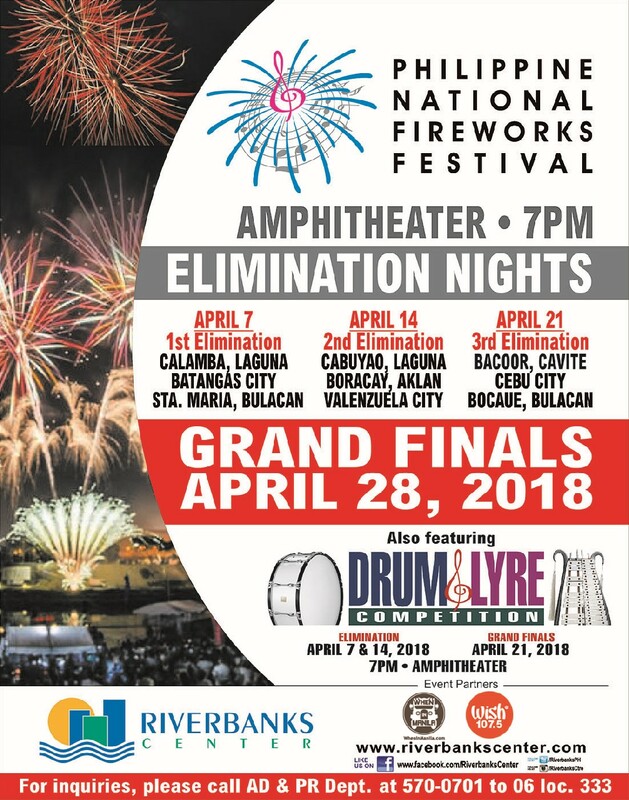 Be awed by the talents of the best pyrotechnic teams invited from the different parts of the country each elimination night. Event dates are April 7, 14 & 21 (Saturdays ) at the Riverbanks Center Amphitheater from 7pm-8pm. There are lots of free seating but be sure to come early to get the best spot. Don’t miss the PNFF finale or the grand finals set on April 28 (Saturday) at 7pm. The best of the best will surely wow everyone. And to add to this year’s exciting festival is a Drum & Lyre Compettion highlighting the talented elementary students from Quezon City, Pasig, Antipolo & Marikina City. You need not travel far to make this summer memorable! So mark your calendars and head to riverbanks center. Riverbanks Center is located at A. Bonifacio Ave., Marikina City. Riverbanks Mall houses over 50 international and localoutlet brands. Current events in the Philippines is really great. I love festivities.